A gay Republican with a sizable social media following, who has criticized Obamacare for “forcing” him to purchase insurance he was sure he’d never need, is turning to crowdfunding after a car accident has left him with medical bills he can’t pay. The “Sassy Gay Republican,” as he calls himself, posted to GoFundMe, asking for $15,000, since the hospital he was taken to didn’t accept his insurance. For those of you who follow my story on Twitter, you know how open I am about my life, & whenever I need help, I always ask. There’s always some guilt for me asking, but right now, I really don’t have a choice. I just got a place to stay & I really need to keep up with the bills so I can better my life as I’m trying so very hard to do. The paramedics & police officer said I was very lucky. People in these types of accidents don’t typically survive, especially at a whopping highway speed of 65MPH. I’m still in shock as I write this, but I know I can get past it. God was with me in that car, I really believe it you guys. It wasn’t my time & I survived, just like I have been this entire time. He explains that he earns his living as a pizza delivery driver, obviously now on hold. The Sassy Gay Republican’s story did not escape the attentions of Twitter. This is one of those DRAMAS where the Sassy Gay protagonist gets SO CLOSE to learning an essential truth but just can't… quite… get it. He is now claiming to be the victim of bullying. 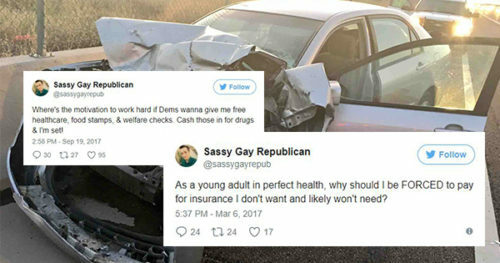 Here are some of the Sassy Gay Republicans tweets, some before and some after the accident, that take on a new relevance when seen in light of his current situation. Where's the motivation to work hard if Dems wanna give me free healthcare, food stamps, & welfare checks. Cash those in for drugs & I'm set!